Can a timeline be useful in historiography? Timelines – visual, spatial presentations of chronology – are generally regarded as being too simple, perhaps too childish, to be worthy of academic attention, yet such chronographics should be capable of supporting sophisticated thinking about history and historiography, especially if they take full advantage of the capabilities of digital technologies. Boyd Davis, S. & Kräutli, F., 2014. 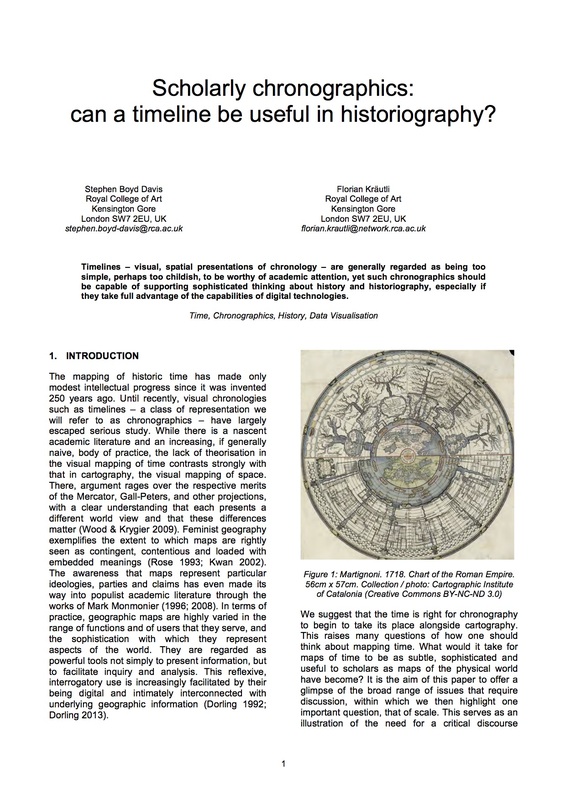 Scholarly chronographics: can a timeline be useful in historiography? European Social Science and History Conference. Vienna, 23-26 April. Amsterdam: International Institute of Social History. Available at http://researchonline.rca.ac.uk/1623.